Noise Phobia, Snake Bits and more! Most pet owners are all too aware of the stress that loud noises like fireworks and thunderstorms can cause in our furry friends. These fears are called noise phobias and it's all to real for many pets. It's important to recognize the signs of noise phobia and how to help reduce the fear in your pet. Keep in mind these are general signs and could be the result of other conditions or diseases. The following information may help your pet deal with loud noises. Keep pets indoors. If the noise is from a visible source like fireworks, close the curtains and use soft music. Provide a "safe place" to escape. It may be under a bed, blanket, or even in their crate...just leave the door open so they don't feel trapped and injure themselves trying to escape. If you must be outside, make sure your pet is on a leash to prevent escape. Prepare ahead. If you know fireworks or a thunderstorm is coming, walk your pet to help them use the restroom now to avoid accidents later. Make sure they are microchipped or have an ID. If you are outside and loud conditions are possible, these precautions will help if your pet runs away. Most importantly don't scold them. Just like children, your pet needs to feel safe not afraid of you. If you feel your pet has severe noise phobia, call or come in to talk about medications that can help. If you feel your pet has severe noise phobia, call or come in to talk about medications that may help. Confucius said, "Choose a job you love, and you will never have to work a day in your life." That quote is the perfect description of Angie, our Employee of the Month. Angie loves what she does and it shows in every pet she grooms. Angie was born in Birmingham and has been grooming pets for over 20 years. 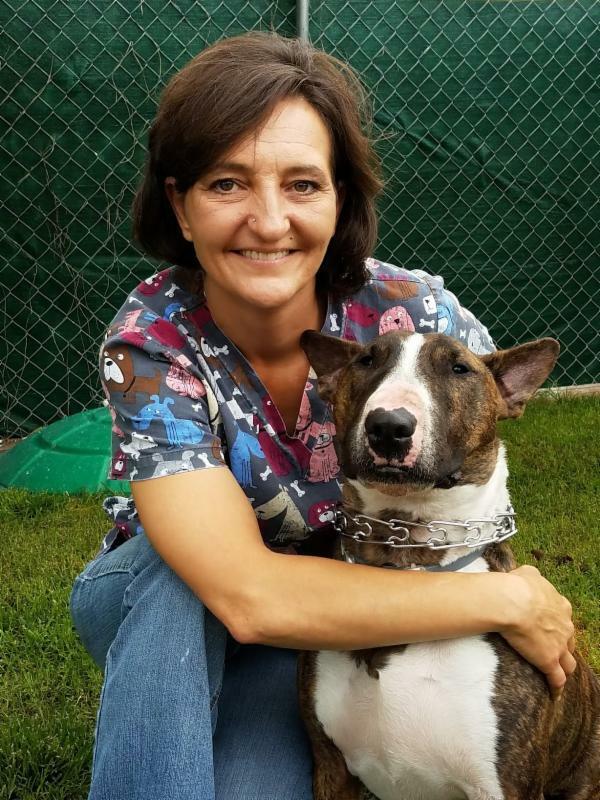 She started out as a vet tech at 16 and quickly found her love and passion was grooming. 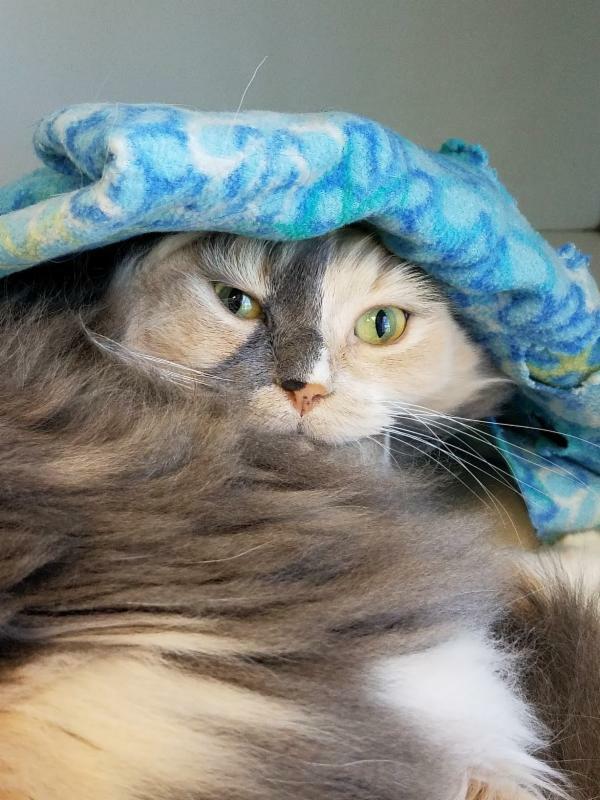 A big part of her expertise is creative grooming with includes coloring and nails. 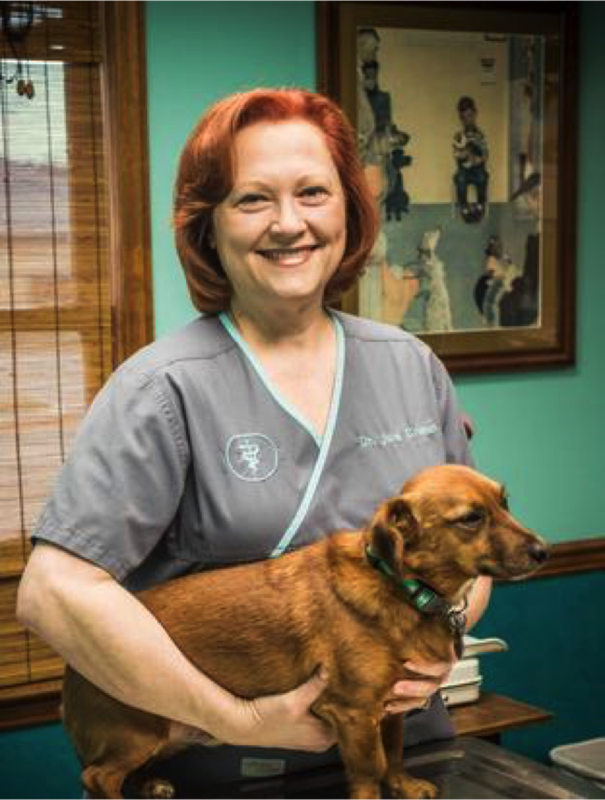 Angie has been at Altadena Valley Animal Clinic for 7 years now and she can't imagine being anywhere else. 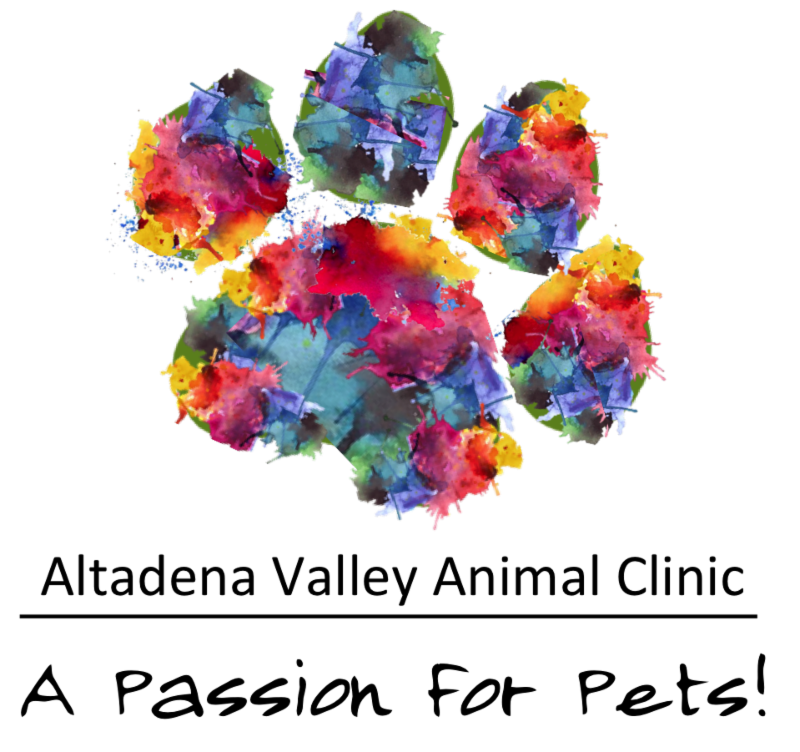 She was recognized as a member of the National Association for Professional Dog Groomers and National Cat Groomers Association. Aside is mom to 6 children that range in age from 3 to 21 years old, and 2 grandchildren. Her pets are also an important part of her family. They include a donkey, miniature pony, chickens, horses, and dogs...Cheech (pictured) and Shoeshine. She also contributes her time and talents to the Birmingham Boston Terrier Rescue. Join me in congratulating Angie as our July Employee of the Month. "Now lets have a look at those teeth." 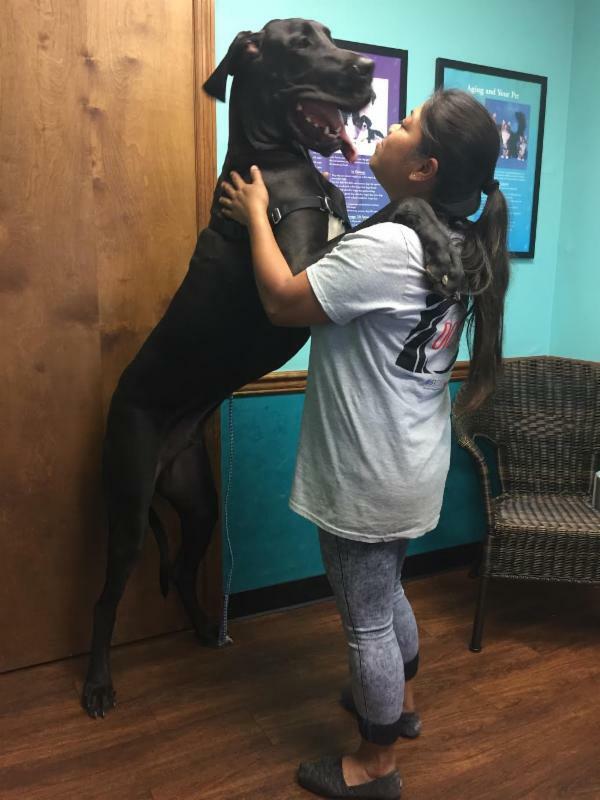 Dillion Russo is one big wonderful dog...and our Pet Picture of the Month. Snakes and Pets: They don't play well together! This is Lottie and she was recently bitten above the eye by a snake. She's going to be okay but this could have turned out much worse. This time of year, snakes are moving and looking for food. If your dog stays outside, make sure you check them for swelling and bruising. Most snakes want to be left alone but an inquisitive dog can cause a snake to be defensive and strike. If your pet is bitten, here are a few important tips. Look your dog over for bite wounds. There could be more than one. 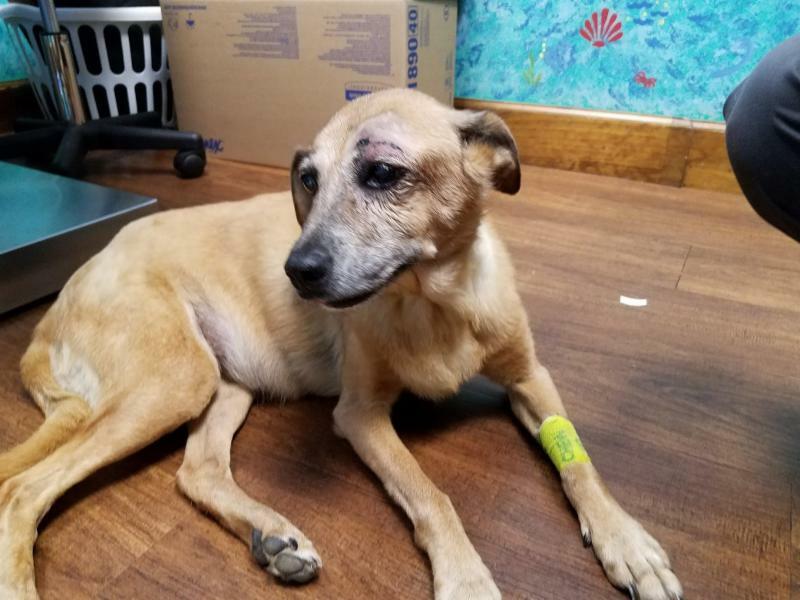 Most importantly, if your pet is bitten take your pet immediately to the nearest animal clinic or emergency pet center, keeping them as calm as possible. We do have anti-venin available to treat your pet. 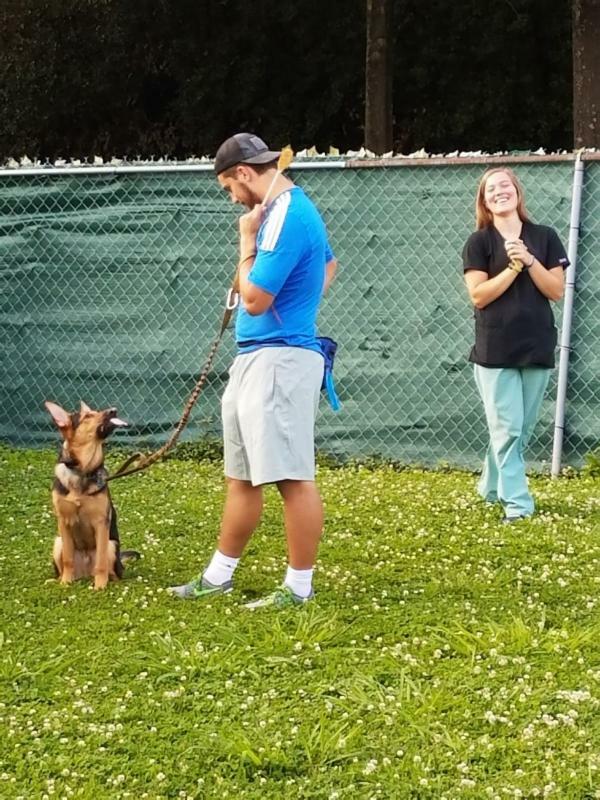 Our first obedience class is close to graduation and we are now taking reservations for a new round of Dog Obedience and Puppy Kindergarten classes. 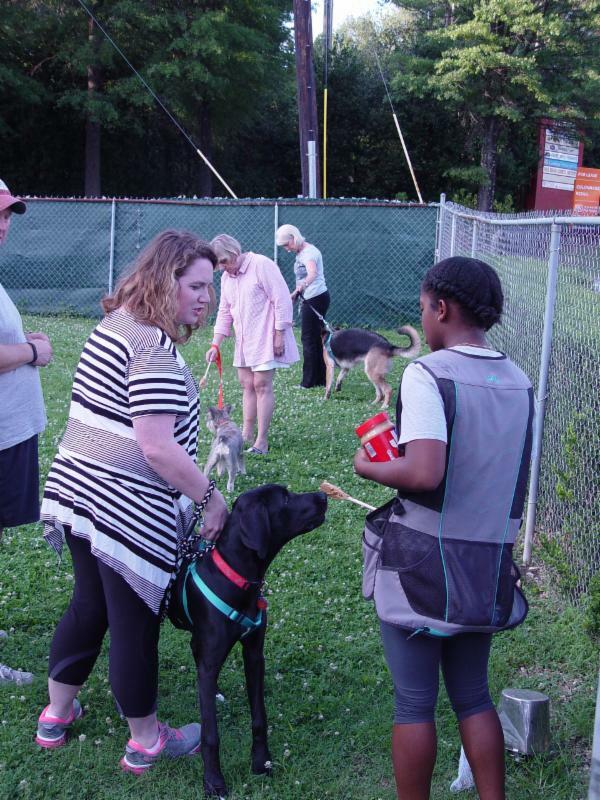 Puppy Kindergarten begins July 8, at 6:00PM and Dog Obedience Training starts July 11, at 6:30PM. Visit our Dog Training Class web page for all the details. 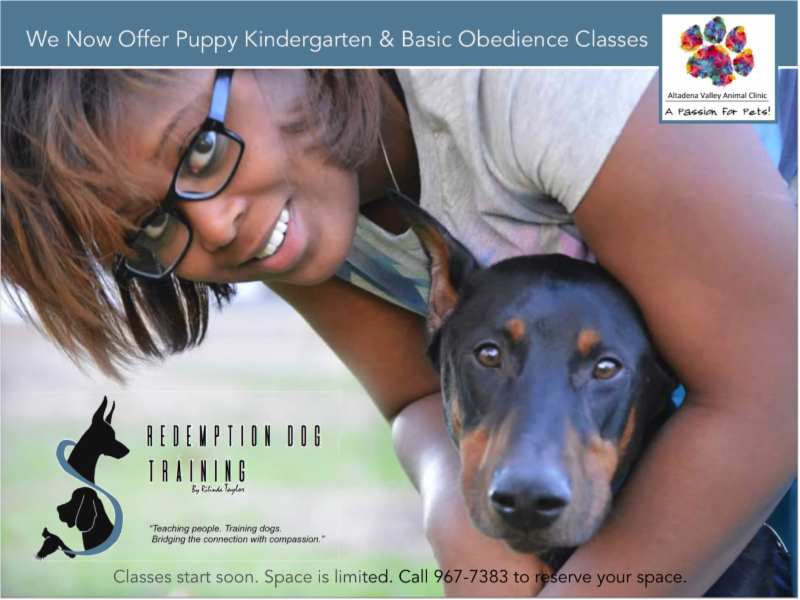 These classes are conducted by Rilinda Taylor, owner and professional trainer with Redemption Dog Training. This is hands-on training for owners and pets, providing a positive environment for learning.